Have you searched for a leak in an air conditioning or refrigeration system recently? Most likely you used a bubble solution. What’s this bubble solution? It’s one of the most popular methods of leak detection in the HVAC industry. It’s effective when spraying a soapy solution over a suspected surface until a bubble appears. This bubble indicates the location of the leak. Sounds archaic, right? 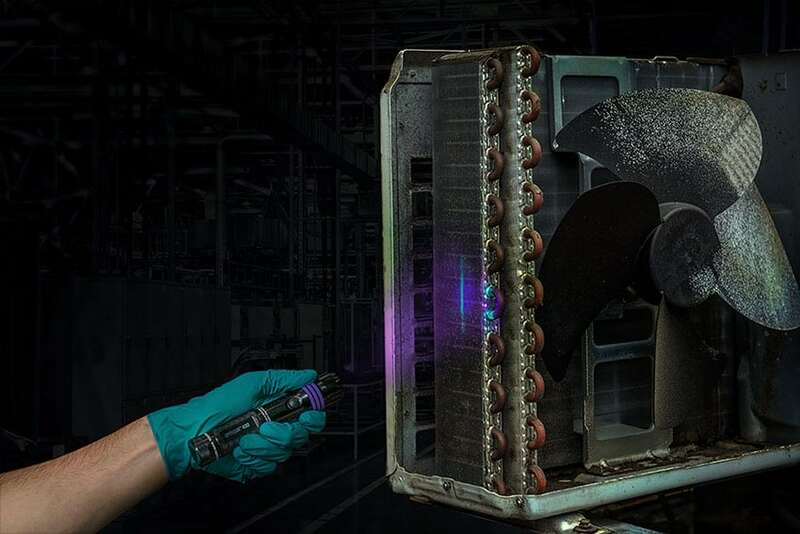 While this method is cost efficient up front, in the long run its inaccuracy ends up costing more by operating a system not running at peak efficiency, high refrigerant replacement costs, food spoilage, and customer callbacks. This time consuming practice keeps technicians on the job for an excessive amount of time. It also makes it extremely difficult to find smaller leaks, especially on an outdoor unit on a windy day. 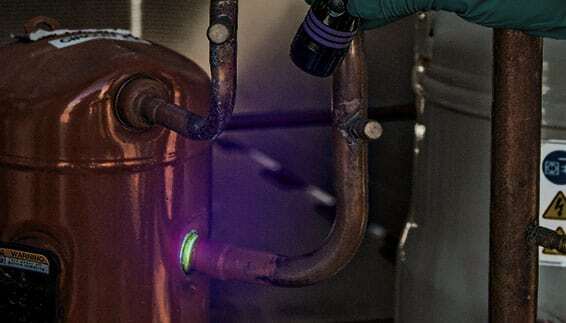 So, what is UV leak detection? It’s a method in which a small amount of fluorescent dye is injected into and circulated through an operating system. The dye/refrigerant mixture will escape and accumulate at all leak sites. By then scanning the system with a leak detection lamp, all leaks will fluoresce green or yellow, making them easy to spot. Don’t feel like waiting for the dye to circulate before getting to work? Well, this method is best when used as part of a comprehensive maintenance plan, in which the dye is added to a system before a problem has occurred. A leak detection flashlight or lamp can then be used to quickly scan the system for leaks during regular maintenance or service calls. If a leak is present, a florescent glow will appear making even the smallest leaks easy to pinpoint. AR-GLO® fluorescent dyes are OEM approved by major compressor, AC&R equipment, lubricant and refrigerant manufacturers. They are currently being used in over 50 million AC&R systems worldwide!